2006 Toronto Gay Pride Parade | Vespinoy! Yep color them rainbows. 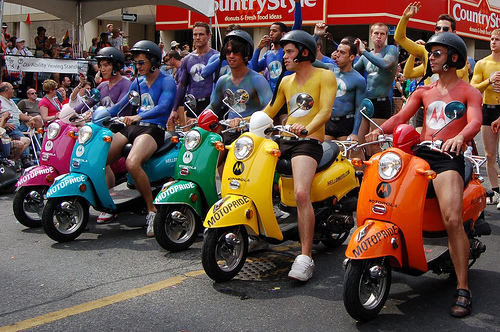 Almost got them all here, scoots during the Motorola sponsored 2006 Toronto Gay Pride Parade. Again courtesy of ScooterScoop.Com. From what I see these are Yamaha Vino scooters. Those are Honda jazz, not yamaha Vino. wonderful issues altogether, you just received a new reader. What would you recommend about your put up that you just made some days ago? Any sure?